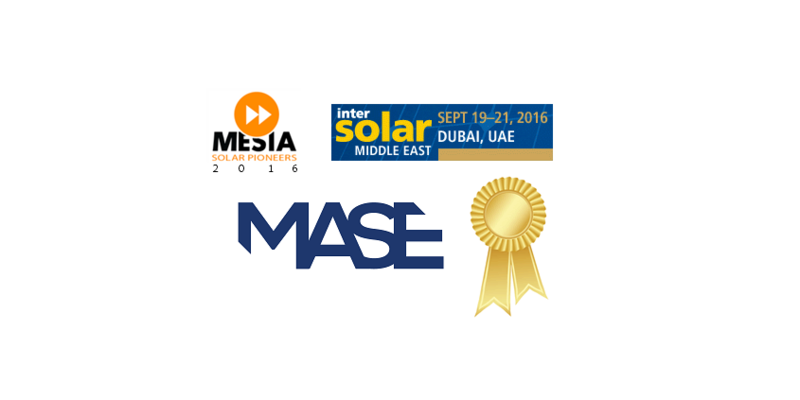 Dubai, UAE – 19 September 2016: MASE’s Director of Operations, Tareq Khalifeh, has won the Middle East Solar Industry Association’s (MESIA) Solar Pioneers 2016 Gold Award presented at Intersolar Middle East 2016 Global Solar Leaders’ Summit Opening Ceremony. MESIA’s mandate is to promote solar power across the Middle East. Achieving this goal involves working closely with the leaders in the solar power sector, both at the government and grass-roots level. To help nurture future generations of solar leaders, this year MESIA has partnered with Intersolar Middle East to put in place the 4th edition of the Solar Pioneers recognition Ceremony. MASE, a Jordan-based regional clean energy developer, installer and O&M provider, has been selected as a finalist for the Intersolar Award 2016 “Outstanding Solar Project” category. The selection by the world’s leading solar event marks global recognition of MASE’s positioning as one of the MENA and GCC region’s most innovative solar installers and project developers. MASE will present its service offering at Intersolar 2016 in Munich and a panel of judges will announce the winners at the Intersolar 2016 event itself. For the award, MASE competes with twelve other international companies from countries including United States, India, Switzerland, Germany and France. According to Intersolar, the “Outstanding Solar Projects” category is a new category for 2016 which pays tribute to applications that set a particularly inspiring example in driving the global energy transformation forward. Projects may involve industrial commercial or residential use of solar energy. “MASE’s recognition by Intersolar marks the introduction of the company and the MASE team to the global solar market. MASE is competing with the world’s leading solar companies and to be selected as a finalist for the Intersolar Award is a spectacular achievement in itself. We are ready for the challenge and are proud of this accomplishment” said Tareq Khalifeh, Director of Operations at MASE. The Intersolar AWARD is presented by the organizers of Intersolar. Products, projects, services or solutions may be submitted by exhibitors from all international Intersolar and ees exhibitions taking place in 2016. Refinements of products and services previously presented at the exhibition are also accepted. As of this year, owners of solar projects are also invited to take part in the award in the Outstanding Solar Projects category. Projects must be fully completed and no older than two years at the time the application for the Intersolar AWARD is submitted.